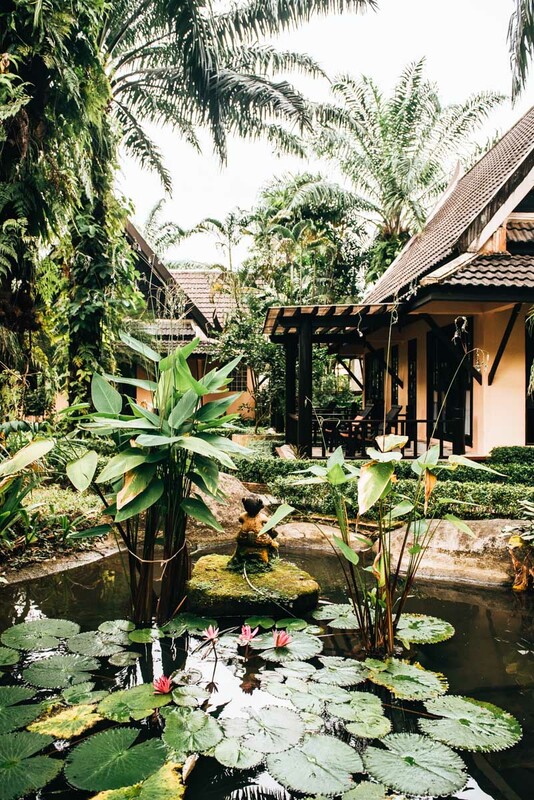 It was a complete coincidence that we spent close to a week here in Khao Lak. Until just few weeks ago, we didn’t really have many places on the west coast of Thailand on our radar. Somehow we were so convinced that Khao Lak was a tourist lure such as Chaweng on Koh Samui or Phuket. We were so wrong. Khao Lak is touristic, yet also very quiet. 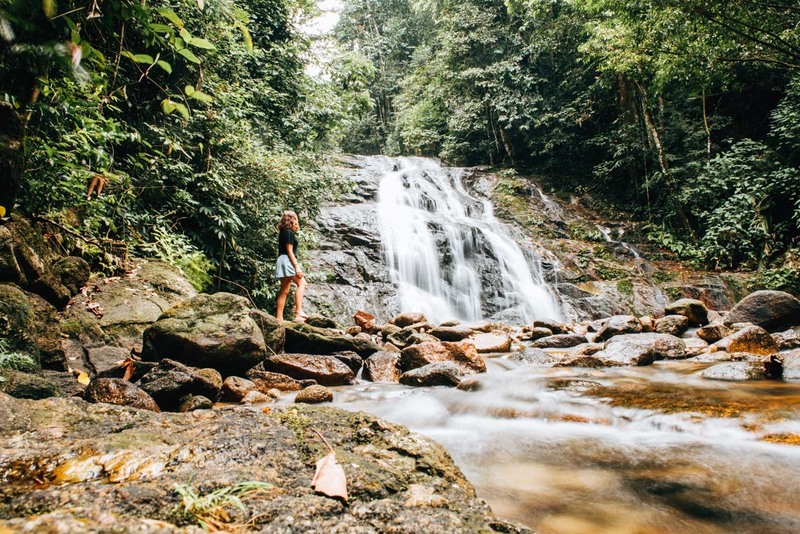 In this blog article, we’ll share with you things we learnt, what you should expect when travelling to Khao Lak and we’ll also share with you some of the top things to-do and see on Khao Lak! 1. Who is Khao Lak suitable for? 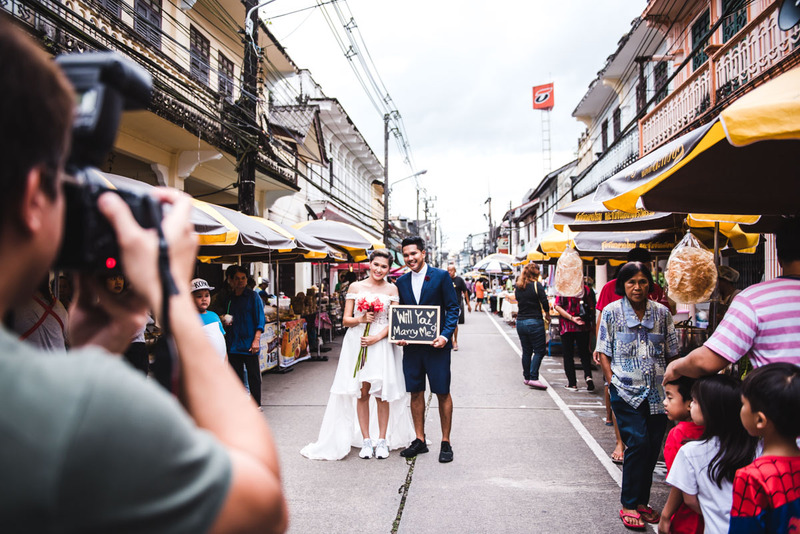 We got the impression that most of the tourists in Khao Lak were couples, but of all ages. Those looking for crazy parties certainly ended up in the wrong place here. Although there are the odd cocktail bars with decent sized speakers, you will not find party tourists such as those in Phuket, luckily. The long sandy beaches also attract families. We met quite a few families with very young children and babies. Unfortunately, the sea had a relatively strong swell during our visit in November, but during good weather periods, the sea is said to be very calm. Khao Lak itself is not just one independent place, its name actually means ‘mountain in the backcountry’. 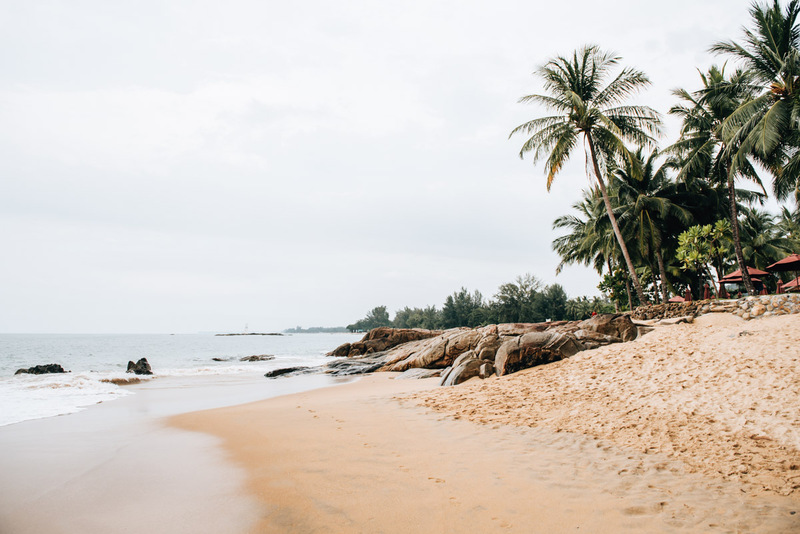 What tourists usually think of “Khao Lak” are in fact their abundance of long beaches stretching out over many kilometres. 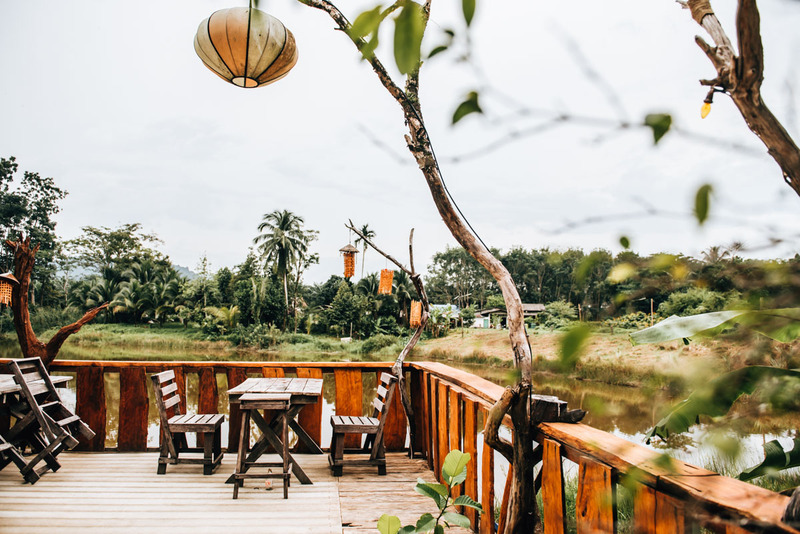 This means that the distances are relatively large and you will be relying on a mode of transport, especially if you don’t want to end up eating at the same restaurants and would prefer to get out and explore the different corners Khao Lak has to offer. 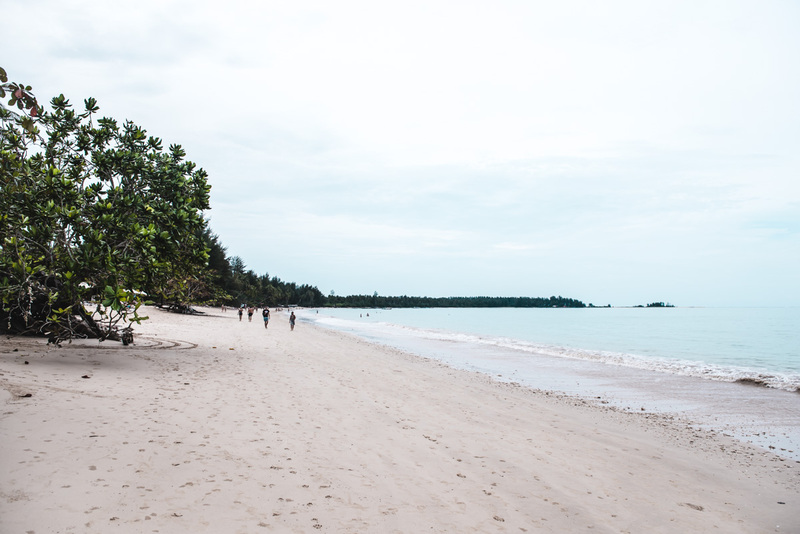 What we liked most about the beaches in Khao Lak, is that they are very long and wide. If you want, you can walk for miles along the beach. In some sections you can find very cool rock formations that are very photogenic. In general, we found all the beaches we explored to our liking. With its fine, very bright sand, the White Sand Beach is something very special and really gorgeous. However, we had the feeling that many day tourists (like us) come here, so don’t get your hopes up that you’ll have this beach to yourselves! In any case, a trip with the scooter is still very worthwhile. The beach is located in the north section of Khao Lak. However, one of our favourites beaches was where our hotel was located (more on this later in the article). The Sunset Beach is located in the south of Khao Lak and is bordered by a hill. You can only go on in one direction here on the beach, which is great in that this section is relatively quiet. We found the beach ideal for an overnight stay. At first we did not fancy a visit the clay Chong Fa waterfall, but we were so glad that we decided otherwise. Compared to many other Thai waterfalls that we know, we found this worth seeing. 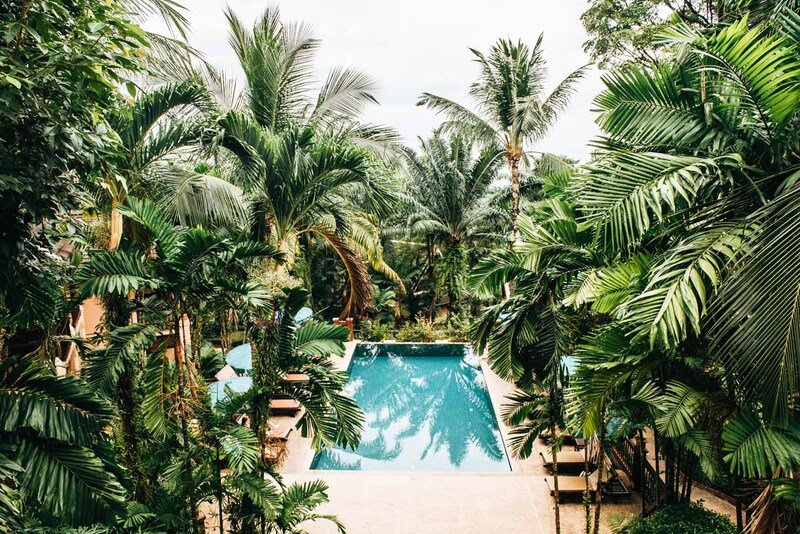 We’re not sure if it was just luck, but there were so few people there during our visit, so we were able to capture that tropical jungle vibe perfectly! The best way to reach Chong Fa Waterfall is by scooter. If you drive north from the “centre”, you have to pay attention to the “mini golf” sign. From there you turn right and drive about 7 km inland. The last 2 km is a gravel road, but totally manageable on a scooter. Entry to the National Park, where the waterfall is located, costs 200 baht. You will have to park the scooter at the parking lot and from there it’s about 15 minutes to the waterfall, with a few uphill sections. Tip: wear sturdy shoes as the track is relatively uneven. You can visit the waterfall every day between 8am and 16:30. Over 10 years ago, Khao Lak became well known in the aftermath of a natural disaster. 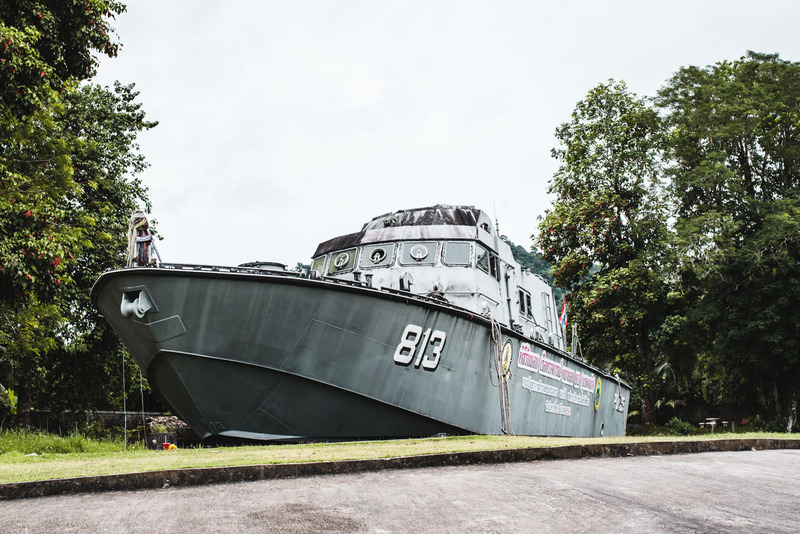 The 2004 tsunami claimed thousands of lives here in Khao Lak and on the day of the catastrophe, police boat 813 was guarding members of the royal family bathing in Khao Lak. It was flushed two kilometres inland by the wave and still stands here to this day. Before you even reach the boat, you can see the extent of damage caused by the violent tsunami. The surrounding areas are unfortunately very run down and neglected. There are a few tsunami museums where you can see photos and videos from that event, which we didn’t have time to visit. There is also a big memorial (“Ban Nam Khem Tsunami Memorial Park”) in the far north of Khao Lak, but unfortunately we didn’t have time to make it here either. On a long wall, the casualties of the disaster are remembered here. 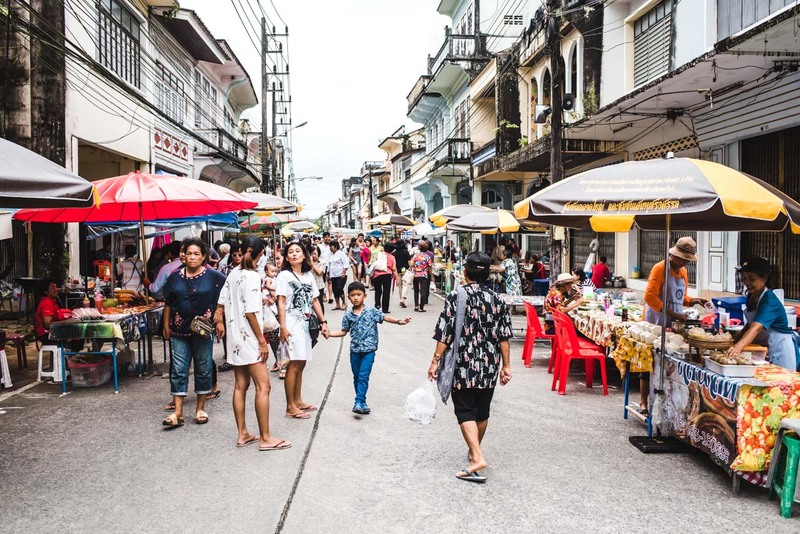 If your trip to Khao Lak takes place over a weekend, we can highly recommend a visit to the atmospheric Sunday Market in the historic centre of Takua Pa. The market is located in the north of Khao Lak, about 45 minutes by scooter from the tourist centre. The long journey is worth it, especially as you meet mostly locals and only a few tourists. We would make the long ride back anytime, just to be surrounded by the abundance of street-food stalls again. Our undisputed favourite was the Kanom Krok. 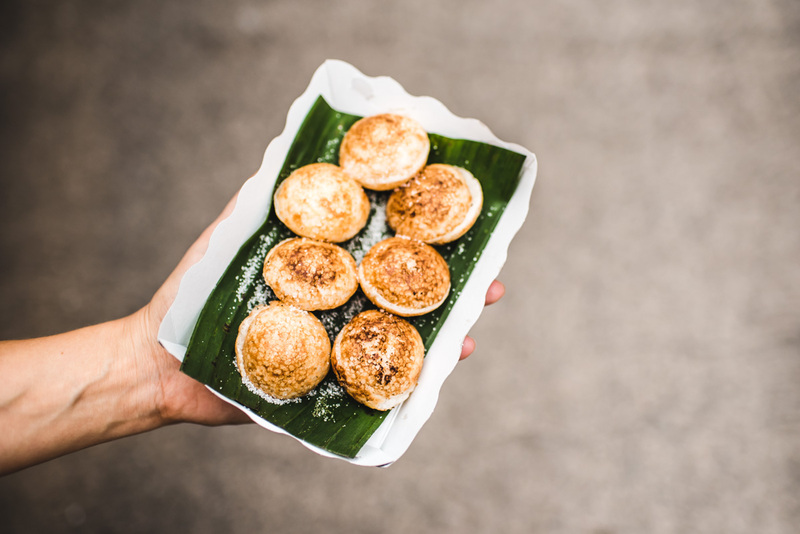 We just love these little coconut rice pudding cakes. The market takes place every Sunday afternoon from about 2pm to about 7pm. 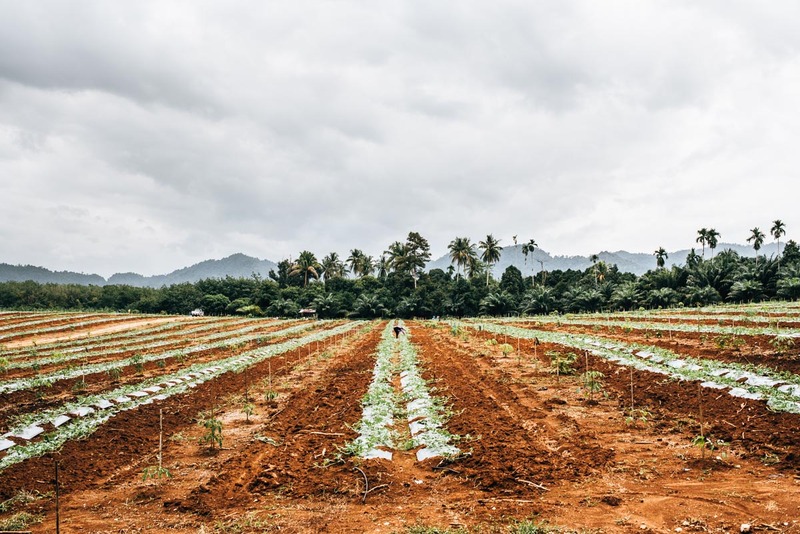 Our tip for the journey: If you plan to get there by scooter, then ride on a little further inland before taking the turn to Takua Pa, as this route is much more scenic than the main road. Incidentally, Takua Pa is not a city, but a district. 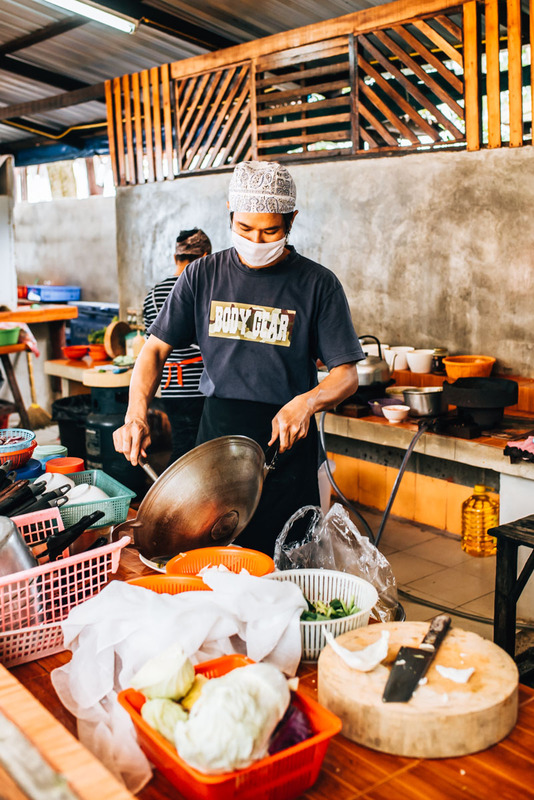 The Sunday market is located in “Old Takua Pa”, which is about 5 km south of the county capital. 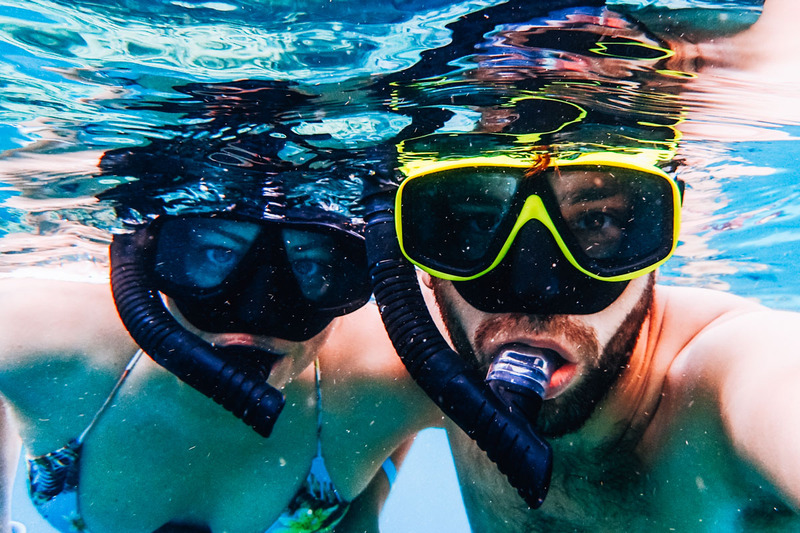 The secluded Surin Islands are one of the most beautiful snorkelling spots in Thailand. Anyone interested in discovering the underwater world is in good hands there. You will reach the Surin Islands after a 1.5 hour boat ride. But we strongly recommend that you only do the excursion in good weather! We had to come to terms with the fact that we were taking a great risk, doing this crossing. We were with the provider SeaStar for the journey, but despite the meter high waves, they didn’t back down and the comment made by the crew member was that: “If tourists pay, then we drive”. At first, hardly anyone on board was aware of the danger, but as we ventured further out and the waves got rougher, all laughs were wiped off, especially those who had seen their breakfast twice. 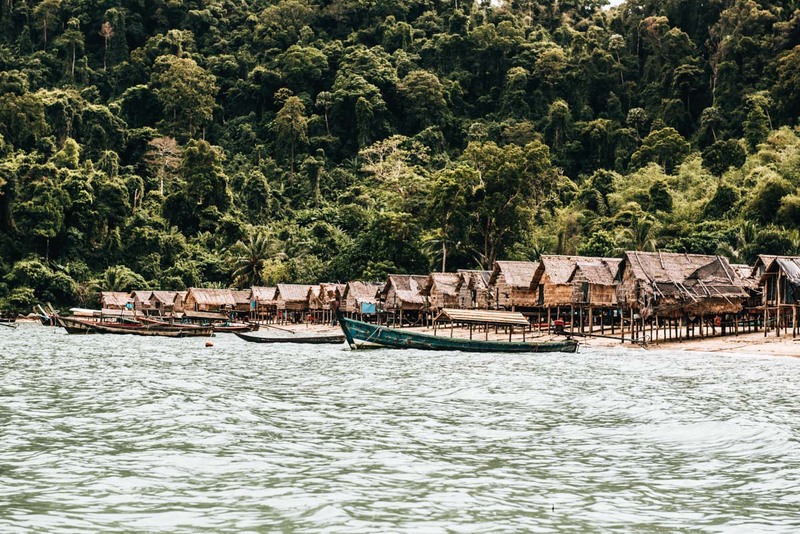 Apart from the horror crossing, the Surin Islands are a truly fantastic place. It was such a pity however, to see that so many corals had died and bleached up from the warming of the seas. It’s a really sad thing to witness the slow destruction of this beautiful marine world and know that we humans are indirectly the cause of this. 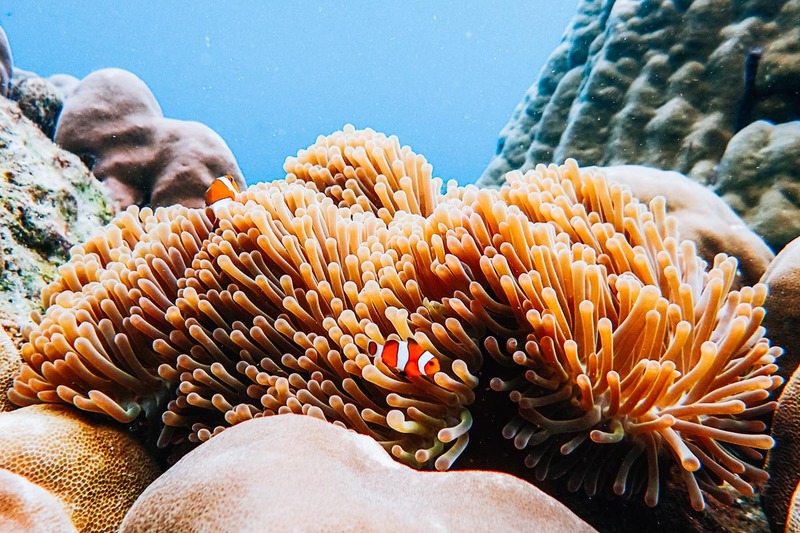 The colourful fishes are of course still beautiful to look at, so yes, we would highly recommend a snorkelling trip, but would definitely recommend a different provider! 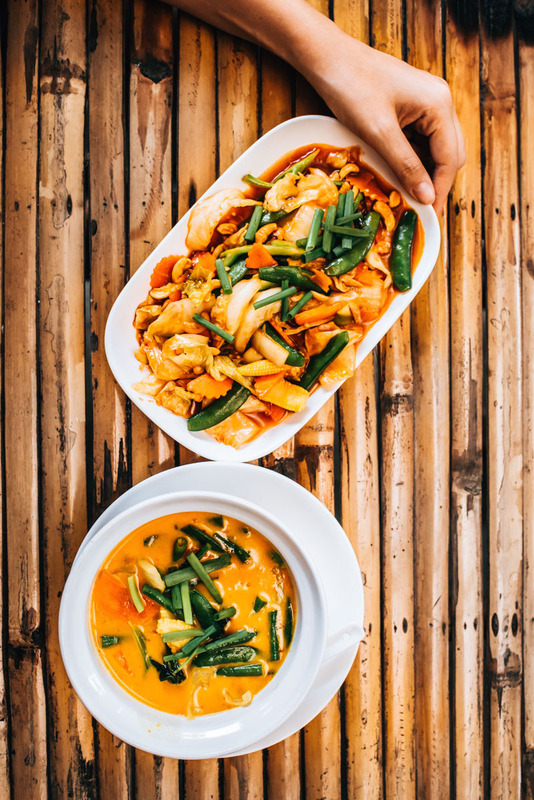 Since Khao Lak is a well-developed tourist destination, there is a correspondingly large selection of restaurants and cafés. As in all tourist places, the prices here in Khao Lak are rather high. 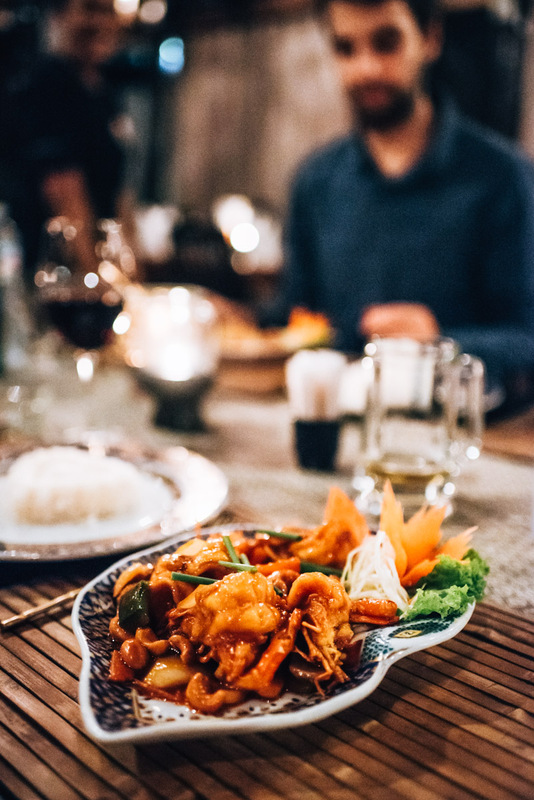 A dinner for two people (including alcoholic drinks) at a standard restaurant will amount to about 12-15 euros. 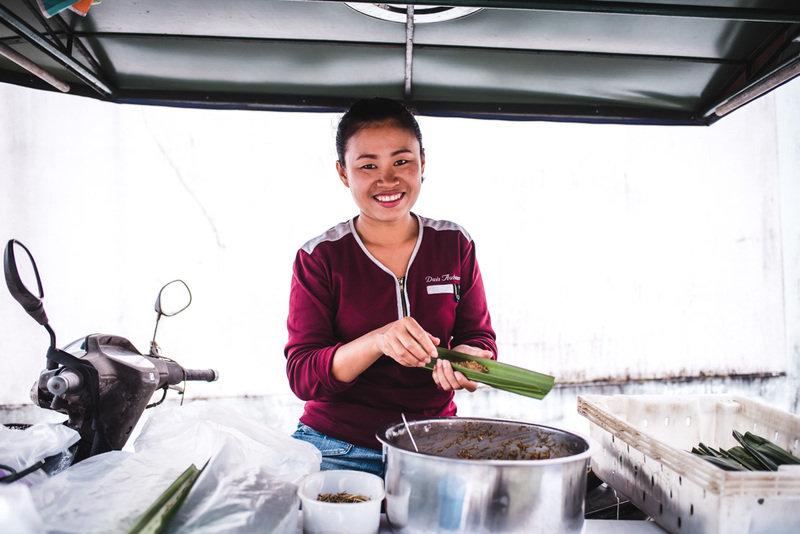 Occasionally you will also find food stalls, where you can eat much cheaper. Great recommendation! We visited the Yellow Snail Cafe 4 times in 5 days – that really says it all. 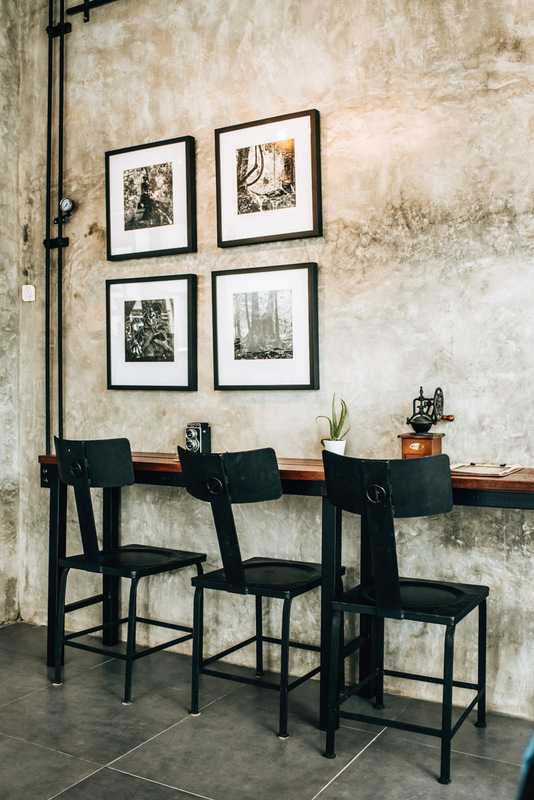 Not only did we love their puristic ambience, but the coffee here is outstanding. 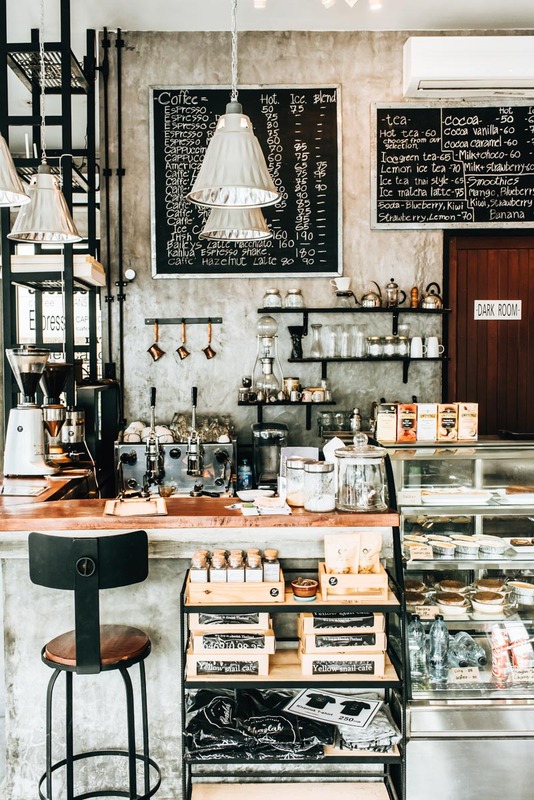 The Espresso Macchiato in the Yellow Snail Cafe is the best we found in the whole of Khao Lak. Another tip: Thanks to the relatively fast internet, we were also able to get our quite a bit of work done here in the Yellow Snail Cafe. 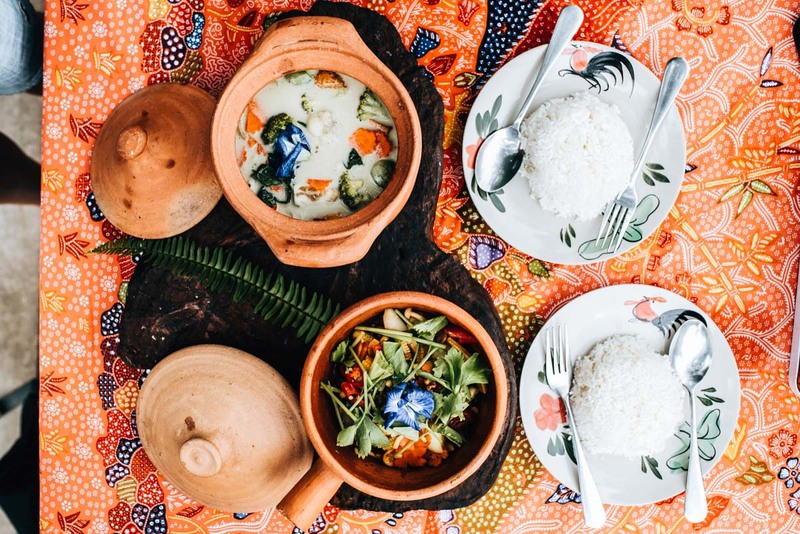 The very casual restaurant is located directly on the beach in the south of Khao Lak and is always well frequented. We came here on more than one occasion and always had a good experience. The Andalea Bar is also a perfect place for sunsets, especially in good weather you can marvel at some spectacular sunsets. The prices are relatively high, as is everywhere in Khao Lak, but at least the Andalea Bar is quite local, with the main courses costing about 150 baht. 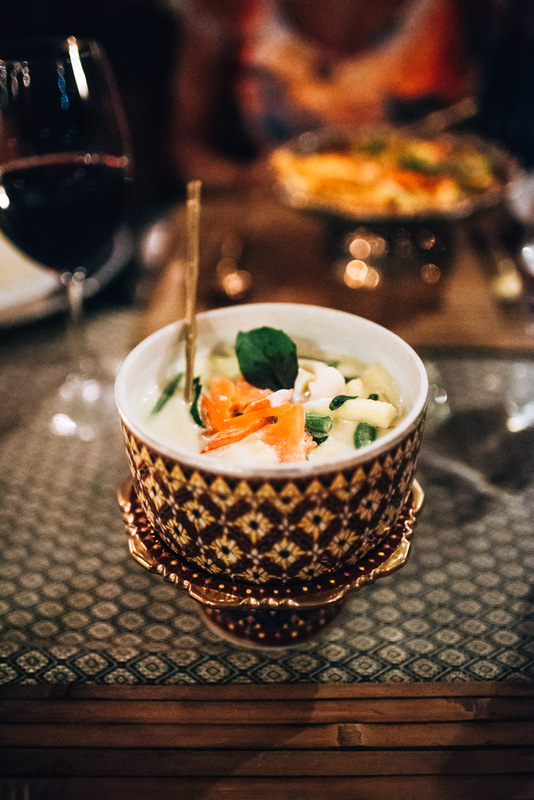 One of our greatest discoveries in Khao Lak was the wonderful Baan Srimuang restaurant. It is completely hidden by a small lake and is definitely worth a visit. The owners are so lovely and the food is just fantastic! Not to mention the atmosphere as well. As we visited during the day, we got to enjoy the nice lake view, but we also imagine it to be very beautiful in the evenings. The only downside: the restaurant is off the beaten track and you depend on some mode of transport. With the scooter however, the Baan Srimuang is quite easy to reach: If you take the main road to the north, then just before the Mariott Hotel you have to turn right and then turn left soon after (watch the sign). Follow the road down and the lake and restaurant should appear on the left side. The prices are absolutely ok: for the both of us we paid 425 Baht for two dishes and two drinks. At first glance, the Gold Elephant looks very touristic and that’s exactly what it’s like when you look at the guests. But the food is really delicious and when compared to what you actually get, the prices aren’t as high as we expected. We ate here twice and both times thought all the dishes tasted great. In terms of price, the Gold Elephant is above the average: For three main courses and three drinks (alcoholic) we paid more than 1000 Baht. We slept a total of 5 nights at the Palm Beach Resort in the south of Khao Lak. There was a reason behind this very narrowed down selection: We were visiting Kathi’s mum here in Khao Lak, who at that time was staying in the neighbouring hotel (Bayfront Resort). As there were no vacancies left, we decided to stay at the Palm Beach Resort. The hotel area in Palm Beach Resort is very green and very idyllic. Most of the rooms are in bungalows. Our room – the “Garden Room Deluxe” – was situated in the lower part of the area close to the beach. The room itself was really nice. We definitely weren’t expecting luxury and our bathroom was looking rather run down, but overall we did feel very very comfortable here. The breakfast was ok, in Thailand you cannot expect too much when it comes to breakfast. We really liked the beach, which was located just in front of the hotel, as we found it to be really calm and tranquil. In general, we find that the hotel prices in Thailand (at least in tourist hotspots) are now overpriced and the Palm Beach Resort is no exception. Our room cost more than 4,000 baht per night, which is of course madness. Nevertheless, we found the hotel to be very nice and accommodating. Too bad that we discovered the great “Mountain Pool” on the day of departure! Khao Lak is located some 70 km north of Phuket in Phang Nga province. The nearest international airport is the one in Phuket so most tourists travel via Bangkok. There are dozens of flights daily between Bangkok and Phuket. From Phuket Airport it takes about 1 hour 15 minutes by taxi to Khao Lak (with some traffic). The prices for this taxi ride are relatively expensive, so expect to pay about about 1,200 baht (over 30 euros) for the ride. It is worthwhile to inquire at the hotel for transport too, as some hotels offer free pick ups from the airport. Khao Lak stretches for many kilometres. If you want to explore different corners and get to know many different beaches, then you are dependent on a mode of transport. Our recommendation is to rent a scooter. We rented a scooter for the entire duration of our stay and paid about 200 Bat per day (per 24hrs). At our rental place, we didn’t have to hand in our passport nor cash as a deposit, which is fantastic but usually, they require both here in Thailand. 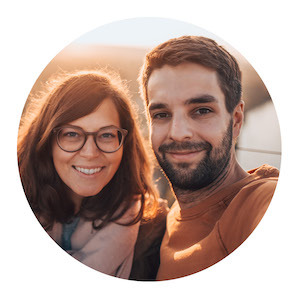 Generally, we always look for rentals that don’t take our passport as deposit. In order to hire a scooter, it’s not actually necessary to have an international driver’s license. However, if you are unlucky and get pulled over by the cops for whatever reason, then it might be an advantage to have one, otherwise you might end up paying a fine (which is roughly 400 baht). Riding a scooter in Khao Lak on the main road is quite uncomfortable, as you are often overtaken by larger vehicles. In Thailand you should generally only rent a scooter if you are good and confident in your abilities to ride one. Also the rule here is big vehicles before smaller one (ahem – you) and as a tourist, you will always be the one at fault no matter what. Whether you decide to take the risk is up to you, of course. The other viable alternative is the open shared taxis (“Songthaews”), which are also quite comfortable and you can easily call one up on the street. For a short distance you should budget about 100 Baht. 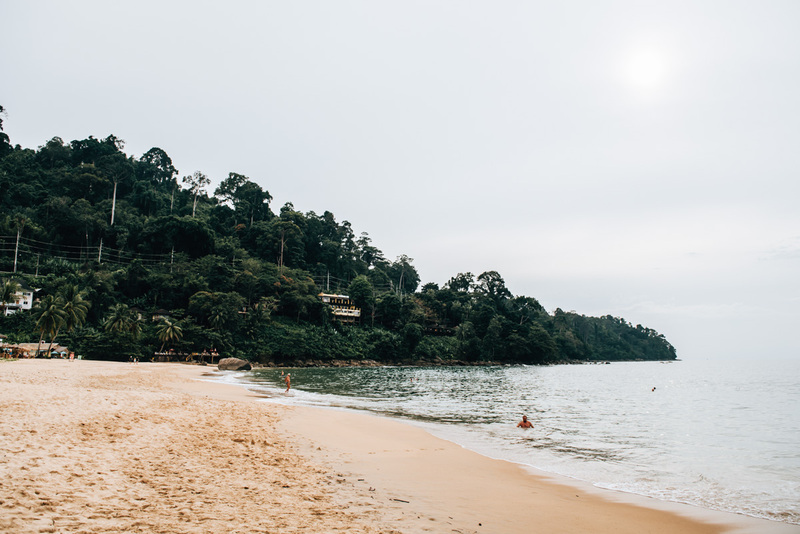 We are curious: Have any of you been in Khao Lak? Do you guys have any extra tips for us? We certainly haven’t seen everything so we really look forward to your comments!